In 1995, a silly little movie about an inanimate pair of dolls, a cowboy and a rocket pilot, changed the face of family entertainment. The instant a little boy named Andy left his room and a group of toys led by a cowboy named Woody came to life, audiences were captivated by their Toy Story. The possibilities offered by this new form of computer animation being demonstrated by start-up studio Pixar were limitless. A cowboy, a dinosaur and a Mr. Potato Head could all come to life in a seamless, realistic set of movements. In a dozen years, Pixar's brand of entertainment has torpedoed the competition, effectively eliminating the box office reign of hand-drawn theatrical animation. There have been seven Pixar movies released. Their domestic box office totals are $191.8 million, $162.8 million, $245.8 million, $255.9 million, $339.7 million, $261.4 million, and $244.1 million. Since 1999, every Pixar release has earned at least $244 million in North American box office revenue. The seven titles average $243.1 million in domestic receipts. Consistency such as this is a rarity in the erratic, uncontrollable realm of movie production. 2007 sees the release of the latest Pixar offering, Ratatouille. 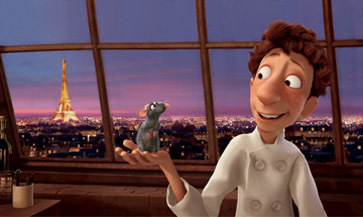 This tale involves a Parisian rat named Remy who shuns his people's normal cuisine, garbage. He is instead drawn to the finest of French foods, meaning that if Remy wants to eat the type of meal he covets, he is forced to sneak into the sorts of establishments that have historically disdained his type due to the pestilence and whatnot. Frustrated by his predicament, Remy embarks upon a mission to become a master chef himself and when he succeeds, he is able to strike a deal giving him access to all the foods needed to keep a rat fat. There has been quite a bit of debate about the box office appeal of Ratatouille. A glut of 2006 and 2007 CGI animation titles has taken away the uniqueness of such productions. In fact, they have circled into the area of over-saturation. Even so, the numbers above don't lie. Pixar is as bullet proof as the industry has ever seen a movie maker be. Even a disappointing performance would mean $225 million in box office, a total nothing else in June is likely to match. I expect Ratatouille to do even better than this, making it the clear choice for the biggest release of the month.